D. Sowers, Dijkstra, J. A., Masetti, G., Mayer, L. A., Mello, K., and Malik, M. A., “Applying a Standardized Classification Scheme (CMECS) to Multibeam Sonar and ROV Video Data on Gosnold Seamount”, in Seafloor Geomorphology as Benthic Habitat: GeoHab Atlas of Seafloor Geomorphic Features and Benthic Habitat, 2nd nd ed., In Press. G. Masetti, Augustin, J. - M., Malik, M. A., Poncelet, C., Lurton, X., Mayer, L. A., Rice, G., and Smith, M., “The Open Backscatter Toolchain (OpenBST) Project: Towards an Open-Source and Metadata-Rich Modular Implementation”, U.S. Hydro 2019. p. Biloxi, MS, 2019. C. Stranne, Mayer, L. A., Jakobsson, M., Weidner, E., Jerram, K., Weber, T. C., Andersson, L., Nilsson, J., Bjork, G., and Gardfeldt, K., “Acoustic Mapping of Mixed Layer Depth”, Ocean Science, vol. 14, 3. pp. 503-514, 2018. M. Di Stefano and Mayer, L. A., “An Automatic Procedure for the Quantitative Characterization of Submarine Bedforms”, Geosciences, vol. 8(1). MDPI, p. 28, 2018. G. Bjork, Jakobsson, M., Assmann, K., Andersson, L., Nilsson, J., Stranne, C., and Mayer, L. A., “Bathymetry and Oceanic Flow Structure at Two Deep Passages Crossing the Lomonosov Ridge”, Ocean Science, vol. 14. Copernicus Publications, pp. 1-13, 2018. M. A. Malik, Lurton, X., and Mayer, L. A., “A Framework to Quantify Uncertainties of Seafloor Backscatter from Swath Mapping Echosounders”, Marine Geophysical Research, vol. 39(1-2). Springer, pp. 151-168, 2018. M. Jakobsson, Hogan, K., and Mayer, L. A., “The Holocene Retreat Dynamics and Stability of Petermann Glacier in Northwest Greenland”, Nature Communications. Springer Nature, 2018. J. A. Dijkstra, Mello, K., Malik, M. A., Sowers, D., and Mayer, L. A., “Mapping Community Structure of Canyons and Seamounts of the Northeastern US Atlantic Margin”, 15th Deep-Sea Biology Symposium. p. Monterey Bay, CA, 2018. L. A. Mayer, “Mapping the World's Oceans”, The Bridge, vol. 48 (3). National Academy of Engineering, pp. 35-42, 2018. L. A. Mayer, Jakobsson, M., Allen, G., Dorschel, B., Falconer, R., Ferrini, V. L., Lamarche, G., Snaith, H., and Weatherall, P., “The Nippon Foundation-GEBCO Seabed 2030 Project: The Quest to See the World's Oceans Completely Mapped by 2030”, Geosciences, vol. 8 (2). 2018. K. Lomac-MacNair, Jakobsson, M., Mix, A. C., Freire, F. F., Hogan, K., Mayer, L. A., and Smultea, M. Ann, “Seal Occurrence and Habitat Use during Summer in Petermann Fjord, Northwestern Greenland”, Arctic, vol. 71(3):334. Arctic Institute of North America, 2018. C. Stranne, Mayer, L. A., Weber, T. C., Ruddick, B. R., Jakobsson, M., Jerram, K., Weidner, E., Nilsson, J., and Gardfeldt, K., “Acoustic Mapping of Thermohaline Staircases in the Arctic Ocean”, Nature Scientific Reports, vol. 7:15192. Springer Nature, pp. 1-9, 2017. M. Morlighem, Williams, C. N., Rignot, E., An, J., Arndt, J. E., Bamber, J. L., Catania, G., Chauche, N., Dowdeswell, J., Dorschel, B., Fenty, I., Hogan, K., Howat, I., Hubbard, A., Jakobsson, M., Jordan, T., Kjeldsen, K. K., Millan, R., Mayer, L. A., Mouginot, J., Noel, B. P. Y., O'Cofaigh, C., Palmer, S., Rysgaard, S., Seroussi, H., Siegert, M., Slabon, P., Straneo, F., van den Broeke, M. R., Weinrebe, W., Wood, M., and Zinglersen, K. B., “BedMachine v3: Complete Bed Topography and Ocean Bathymetry Mapping of Greenland From Multibeam Echo Sounding Combined With Mass Conservation”, Geophysical Research Letters, vol. 44. John Wiley and Sons, Inc., p. 11, 2017. M. A. O'Regan, Backman, J., Barrientos, N., Cronin, T., Gemery, L., Kirchner, N., Mayer, L. A., Nilsson, J., Noormets, R., Pearce, C., Semiltov, I., Stranne, C., and Jakobsson, M., “The De Long Trough: A Newly Discovered Glacial Trough on the East Siberian Continental Margin”, Climate of the Past, vol. 13,9. Copernicus Publications, pp. 1269-1284, 2017. M. Jakobsson, Anderson, L., Backman, J., Barrientos, N., Bjork, G., Coxall, H., Cronin, T., de Boer, A., Gemery, L., Jerram, K., Johansson, C., Kirchner, N., Mayer, L. A., Mörth, C. - M., Nillson, J., Noormets, R., O'Regan, M. A., Pearce, C., Semiltov, I., and Stranne, C., “The Deglacial to Holocene Paleoceanography of Bering Strait: Results From the SWERUS-C3 Program”, 2017 Fall Meeting, American Geophysical Union (AGU). p. New Orleans, LA, 2017. G. Masetti, Calder, B. R., and Mayer, L. A., “How to Improve the Quality and the Reproducibility for Acoustic Seafloor Characterization”, GeoHab 2017. p. Nova Scotia, Canada, 2017. E. Weidner, Weber, T. C., and Mayer, L. A., “Implementation of an Acoustic-based Methane Flux Estimation Methodology in the Eastern Siberian Arctic Sea ”, 2017 Fall Meeting, American Geophysical Union (AGU). p. New Orleans, LA, 2017. E. Weidner, Jakobsson, M., Nycander, J., and Mayer, L. A., “A Multi-Frequency Investigation of the Influences of Groundwater Discharge on Hydrocarbon Emission and Transport in the Baltic Sea”, 2017 Fall Meeting, American Geophysical Union (AGU). p. New Orleans, LA, 2017. M. Jakobsson, Pearce, C., Cronin, T., Backman, J., Anderson, L., Barrientos, N., Bjork, G., Coxall, H., de Boer, A., Mayer, L. A., Mörth, C. - M., Nilsson, J., Rattray, J. E., Stranne, C., Semiltov, I., and O'Regan, M. A., “Post-Glacial Flooding of the Bering Land Bridge Dated to 11 cal ka BP Based on New Geophysical and Sediment records”, Climate of the Past, vol. 13. Copernicus Publications, pp. 991-1005, 2017. L. A. Mayer, “Seafloor Mapping: We’ve Come a Long Way – But Still Have Far to Go”, 2017 Fall Meeting, American Geophysical Union (AGU). p. New Orleans, LA, 2017. E. Weidner, Mayer, L. A., Jerram, K., Weber, T. C., Jakobsson, M., Chernykh, D., Ananiev, R., Mohammad, R., and Semiltov, I., “Acoustic and Geomorphological Signatures of Gas Seeps on the East Siberian Margin”, 2016 Graduate Research Conference. University of New Hampshire, Durham, NH, 2016. L. A. Mayer, “The Arctic Continental Shelf and Its Evolving Morphologic Context”, in Challenges of the Changing Arctic: Continental Shelf, Navigation and Fisheries, vol. 19, M. Nordquist, Moore, J. M., and Long, R., Eds. Leiden, The Netherlands: Brill Nijhoff Press, 2016, pp. 17–41. L. A. Mayer and Gardner, J. V., “Cascades and Plunge Pools in the Gulf of Alaska”, in Atlas of Submarine Glacial Landforms: Modern, Quaternary and Ancient, vol. Memoirs, London, UK: Geological Society of London , 2016, pp. 389-390. J. V. Gardner and Mayer, L. A., “Chatham Fan and Adjacent Upper Baranof Fan Channels and Levee, U.S. Gulf of Alaska Margin”, in Atlas of Submarine Glacial Landforms: Modern, Quaternary and Ancient, vol. Memoirs, London, UK: Geological Society of London , 2016, p. 387. M. Jakobsson, Nilsson, J., Anderson, L., Backman, J., Bjork, G., Cronin, T., Kirchner, N., Koshurnikov, A., Mayer, L. A., Noormets, R., O'Regan, M. A., Stranne, C., Ananiev, R., Barrientos, N., Chernykh, D., Coxall, H., Eriksson, B., Floden, T., Gemery, L., Gustafson, O., Jerram, K., Johansson, C., Khortov, A., Mohammad, R., and Semiltov, I., “Evidence for an Ice Shelf Covering the Central Arctic Ocean During the Penultimate Glaciation”, Nature Communications, vol. 7. Macmillan Publishers Ltd., 2016. N. A. Raineault, Ballard, R., Mayer, L. A., Fisher, C. R., Carey, S., Marsh, L., Kane, R., Tüzün, S., Shank, T. M., and Smart, C., “Exploration of Hydrothermal Vents Along the Galapagos Spreading Center”, Oceanography, vol. 29, No.1, Supplement. The Oceanography Society, pp. 35-7, 2016. K. Hogan, Jakobsson, M., Mayer, L. A., Mix, A. C., Jerram, K., Nielsen, T., Kamla, E., Stranne, C., and Eriksson, B., “The Glacimarine Sediment Budget of the Nares Strait-Petermann Fjord Area Since the Last Glacial Maximum”, 2016 Fall Meeting, American Geological Society (AGU). San Francisco, CA, 2016. M. Jakobsson, Gyllencreutz, R., Mayer, L. A., Dowdeswell, J., Canals, M., Todd, B. J., Dowdeswell, E. K., Hogan, K., and Larter, R. D., “Mapping Submarine Glacial Landforms Using Acoustic Methods”, in Atlas of Submarine Glacial Landforms: Modern, Quaternary and Ancient, vol. Memoirs, London, UK: Geological Society of London, 2016, pp. 17-40. N. A. Raineault, Mayer, L. A., Ballard, R., and Irish, O., “Mapping the Eastern Pacific Ocean”, Oceanography, vol. 29, No.1, Supplement. The Oceanography Society, pp. 38-9, 2016. A. C. Mix, Jakobsson, M., Andrews, J. T., Jennings, A., Mayer, L. A., Anderson, S. T., Brook, E., Ceperley, E., Cheseby, M., Clark, J., Dalerum, F., Dyke, L. M., Einarsson, D., Erkisson, D. B., Frojd, C., Glueder, A., Hedman, U., Heirman, K., Heuze, C., Hogan, K., Padman, J., Pecnerova, P., Reilly, B., Reusche, M., Ross, A., Stranne, C., Marcott, S. A., Muenchow, A., Stoner, J. S., Andresen, C. S., Nicholls, K. W., Holm, C., Jerram, K., Krutzfeld, J., Nicolas, L., Par, L., Lomac-MacNair, K., Madlener, S., McKay, J., Meijer, T., Meiton, A., Brian, M., Mohammad, R., Molin, M., Moser, C., Normark, E., Trinhammer, P., Walczak, M. H., Walczak, P., Washam, P., Karasti, M., and Anker, P., “The Petermann Glacier Experiment, NW Greenland”, 2016 Fall Meeting, American Geological Society (AGU). p. San Francisco, CA, 2016. E. Weidner, Mayer, L. A., Jakobsson, M., Chernykh, D., Ananiev, R., Weber, T. C., Jerram, K., Mohammad, R., and Semiltov, I., “Quantification of Methane Gas Flux and Bubble Fate on the Eastern Siberian Arctic Shelf Utilizing Calibrated Split-beam Echosounder Data”, 2016 Fall Meeting, American Geological Union (AGU). p. San Francisco, CA, 2016. L. A. Mayer, Calder, B. R., and Mosher, D. C., “U.S. Law of the Sea Cruise to Map and Sample the US Arctic Ocean Margin, Healy 1603”, Center for Coastal and Ocean Mapping / Joint Hydrographic Center, University of New Hampshire, Durham, NH, 2016. S. B. Mukasa, Mayer, L. A., Aviado, K., Bryce, J., Andronikov, A., Brumley, K., Blichert-Toft, J., Petrov, O., and Shokalsky, S., “Alpha / Mendeleev Ridge and Chukchi Borderland 40Ar/39Ar Geochronology and Geochemistry: Character of the First Submarine Intraplate Lavas Recovered from the Arctic Ocean”, EGU General Assembly 2015, vol. 17. Vienna, Austria, 2015. K. Brumley, Miller, E. L., Konstantinou, A., Grove, M., Meisling, K. E., and Mayer, L. A., “First Bedrock Samples Dredged from Submarine Outcrops in the Chukchi Borderland, Arctic Ocean”, Geosphere, vol. 11, no. 1. The Geological Society of America, pp. 76-92, 2015. F. F. Freire, Gyllencreutz, R., Greenwood, S., Mayer, L. A., Egilsson, A., Thorsteinsson, T., and Jakobsson, M., “High Resolution Mapping of Offshore and Onshore Glaciogenic Features in Metamorphic Bedrock Terrain, Melville Bay, Northwestern Greenland”, Geomorphology, vol. 250. Elsevier, pp. 29-40, 2015. E. J. Shumchenia, Guarinello, M. L., Carey, D. A., Lipsky, A., Greene, J., Mayer, L. A., Nixon, M. E., and Weber, J., “Inventory and Comparative evaluation of Seabed Mapping, Classification and Modeling Activities in the Northwest Atlantic, USA to Support Regional Ocean Planning”, Journal of Sea Research, vol. 100. Elsevier, pp. 133-149, 2015. D. C. Mosher, Courtney, R. C., Jakobsson, M., Gebhardt, C., and Mayer, L. A., “Mapping the Surficial Geology of the Arctic Ocean: A Layer for the IBCAO”, Offshore Technology Conference (OTC). Society of Petroleum Engineers, Copenhagen, Denmark, 2015. L. A. Mayer, Weidner, E., Jerram, K., Weber, T. C., Jakobsson, M., Chernykh, D., Ananiev, R., Mohammad, R., and Semiltov, I., “A Multi-Frequency Look at Gas Seeps on the East Siberian Margin”, 2015 Fall Meeting, American Geophysical Union (AGU). San Francisco, CA, 2015. E. Weidner, Mayer, L. A., Weber, T. C., Jakobsson, M., Chernykh, D., Ananiev, R., Mohammad, R., and Semiltov, I., “A Multi-Frequency Look at Gas Seeps on the East Siberian Margin”, AGU Fall 2015 Conference . American Geophysical Union , San Francisco, CA, 2015. T. C. Weber, Mayer, L. A., Jerram, K., Beaudoin, J., Rzhanov, Y., and Lavalvo, D., “Acoustic estimates of methane gas flux from the seabed in a 6000 km2 region of the Northern Gulf of Mexico”, Geochemistry, Geophysics, Geosystems, vol. 15, no. 5. AGU, pp. 1911-1925, 2014. M. Jakobsson, Andreassen, K., Bjarndottir, L. R., Dove, D., Dowdeswell, J., England, J. H., Funder, S., Hogan, K., Ingolfsson, O., Jennings, A., Larson, N. K., Kirchner, N., Landvik, J. Y., Mayer, L. A., Mikkelsen, N., Moller, P., Niessen, F., Nilsson, J., O'Regan, M. A., Polyak, L., Norgaard-Pedersen, N., and Stein, R., “Arctic Ocean Glacial History”, Quaternary Science Reviews, vol. 92. pp. 42-67, 2014. A. F. Flinders, Mayer, L. A., Calder, B. R., and Armstrong, A. A., “Evaluation of Arctic Multibeam Sonar Data Using Nadir Crossover Analysis and Compilation of a Full-Resolution Data Product”, Computers and Geosciences, vol. 66. Elsevier, pp. 228-236, 2014. C. R. German, Boetius, A., Whitcomb, L. L., Jakuba, M., Bailey, J., Judge, C., McFarland, C., Suman, S., Elliott, S., Katlein, C., Arndt, S., Bowen, A., Yoerger, D., Kinsey, J., Mayer, L. A., Nicolaus, M., Laney, S., Singh, H., Maksym, T. L., and Team, P. S. 86 Scienti, “First scientific dives of the Nereid Under Ice hybrid ROV in the Arctic Ocean”, 2014 Fall Meeting, American Geophysical Union (AGU). San Francisco, CA, 2014. 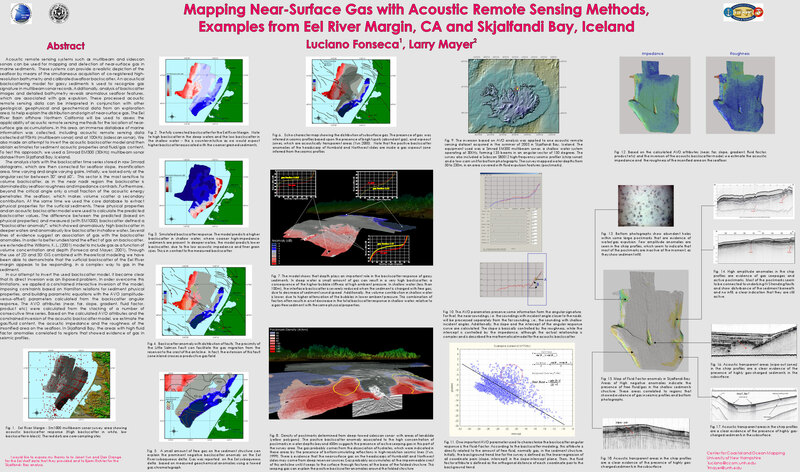 F. F. Freire, Gyllencreutz, R., Greenwood, S., Mayer, L. A., and Jakobsson, M., “High-resolution Mapping of Offshore and Onshore Glaciogenic Features in Melville Bay, Northwestern Greenland”, 2014 Fall Meeting, American Geophysical Union (AGU). San Francisco, CA, 2014. D. C. Mosher, Jakobsson, M., Gebhardt, C., and Mayer, L. A., “Mapping the Surficial Geology of the Arctic Ocean”, 2014 Fall Meeting, American Geophysical Union (AGU). San Francisco, CA, 2014. L. A. Mayer, “Ocean Mapping”, Journal of Ocean Technology, vol. 9. No. 2. Fisheries and Marine Institute of Memorial University of Newfoundland, St. John's, Newfoundland, Canada, pp. 13-18, 2014. L. L. Whitcomb, Jakuba, M., German, C. R., Bowen, A., Yoerger, D., Kinsey, J., Mayer, L. A., McFarland, C., Suman, S., Bailey, J., Judge, C., Elliott, S., Gomez-Ibanez, D., Taylor, C., Machado, C., Howland, J., Kaiser, C. L., Heintz, M., Pontbriand, C., O'hara, L., McDonald, G., and Boetius, A., “Preliminary Polar Sea Trials of Nereid-UI: A Remotely Operated Underwater Vehicle for Oceanographic Access Under Ice”, 2014 Fall Meeting, American Geophysical Union (AGU). San Francisco, CA, 2014. M. Di Stefano, Masetti, G., and Mayer, L. A., “Use of seafloor stereo-images to validate automatic classification of benthic habitats”, GeoHab 2014. Lorne, Victoria, Australia, 2014. L. A. Mayer and Gardner, J. V., “What a Difference a Swath Makes!”, AGU Fall Meeting. San Francisco, CA, 2014. T. C. Weber, Jerram, K., Rzhanov, Y., Mayer, L. A., and Lovalvo, D., “Acoustic and optical observations of methane gas seeps in the Gulf of Mexico”, Proceedings of Meetings on Acoustics, vol. 19. 2013. M. Jakobsson, “Arctic Ocean Bathymetry: A required geospatial framework”, The Arctic Observing Summit . 2013. T. M. O'Brien, Brumley, K., Miller, E. L., and Mayer, L. A., “The Caledonian suture in the high Arctic? New Data from the Chukchi Borderland, Amerasia Basin”, 2013 Fall Meeting, American Geophysical Union (AGU). San Francisco, CA, 2013. M. A. Malik, Mayer, L. A., Weber, T. C., Calder, B. R., and Huff, L. C., “Challenges of defining uncertainty in multibeam sonar derived seafloor backscatter”, International Underwater Acoustic Conference and Exhibition. Corfu, Greece, 2013. C. Englert, Butkiewicz, T., Mayer, L. A., Trembanis, A., Beaudoin, J., Schmidt, V. E., and Duval, C., “Designing Improved Sediment Transport Visualizations”, MTS/IEEE Oceans 2013. IEEE, San Diego, CA, USA, 2013. A. Trembanis, Duval, C., Beaudoin, J., Schmidt, V. E., Miller, D., and Mayer, L. A., “A detailed seabed signature from Hurricane Sandy revealed in bedforms and scour”, Geochemistry Geophysics Geosystems, vol. 14. AGU and the Geochemical Society, 2013. K. Brumley, Mukasa, S. B., O'Brien, T. M., Mayer, L. A., and Chayes, D. N., “Dredged Bedrock Samples from the Amerasia Basin, Arctic Ocean”, 2013 Fall Meeting, American Geophysical Union (AGU). San Francisco, CA, 2013. G. Mitchell, Mayer, L. A., Bell, K. L., Raineault, N. A., Roman, C., Ballard, R., Cornwell, K., Hine, A., Shinn, E., Dimitriadis, I., and Bogdan, O., “Exploration of Eratosthenes Seamount – A continental fragment being forced down an oceanic trench”, Oceanography , vol. 26. Oceanography Society, pp. 36-41, 2013. C. Duval, Trembanis, A., Beaudoin, J., Schmidt, V. E., and Mayer, L. A., “Hurricane Sandy’s Fingerprint: Ripple Bedforms at an Inner Continental Shelf Sorted Bedform Field Site”, 2013 Fall Meeting, American Geophysical Union (AGU). San Francisco, CA, 2013. A. Trembanis, Beaudoin, J., Duval, C., Schmidt, V. E., and Mayer, L. A., “Morphodynamic Impacts of Hurricane Sandy on the Inner-shelf”, 2013 Fall Meeting, American Geophysical Union (AGU). San Francisco, CA, 2013. J. Beaudoin, Weber, T. C., Jerram, K., Rice, G. A., Malik, M. A., and Mayer, L. A., “Multibeam Echosounder System Optimization for Water Column Mapping of Undersea Gas Seeps”, FEMME-2013. Boston, MA, United States, 2013. M. Jakobsson, Mayer, L. A., and Marcussen, C., “Scientific Discoveries in the Central Arctic Ocean Based on Seafloor Mapping Carried Out to Support Article 76 Extended Continental Shelf Claims”, 2013 Fall Meeting, American Geophysical Union (AGU). San Francisco, CA, 2013. D. Sowers, Mayer, L. A., and Gardner, J. V., “Utilizing New Multibeam Sonar Datasets to Map Potential Locations of Sensitive Benthic Habitats in the U.S. Atlantic Extended Continental Shelf”, 2013 Fall Meeting, American Geophysical Union (AGU). San Francisco, CA, 2013. T. C. Weber, Mayer, L. A., De Robertis, A., Greenaway, S. F., Rice, G. A., Beaudoin, J., and Shedd, B., “Acoustic observations of oil and gas in the northern Gulf of Mexico during and after the Deepwater Horizon spill”, 243rd Meeting of the American Chemical Society. 2012. T. C. Weber, Jerram, K., and Mayer, L. A., “Acoustic sensing of gas seeps in the deep ocean with split-beam echosounders”, 11th European Conference on Underwater Acoustics, Edinburgh, Scotland. 2012. A. Gracia, Guinda Salsamendi, X., Juanes, J. A., Rzhanov, Y., and Mayer, L. A., “Application of Landscape Mosaics for the Ecological Status Assesment of Subtidal Macroalgae Communities Using the CFR Index”, XIII International Symposium on Oceanography of the Bay of Biscay. Santander, Spain, 2012. L. A. Mayer, “Arctic Marine Research: A U.S. Practitioner's Perspective”, in Arctic Science, International Law and Climate Change, Berlin, Germany: Springer Heidleberg, 2012, pp. 83-95. A. C. G. Schimel, Rzhanov, Y., Fonseca, L., Mayer, L. A., and Immenga, D., “Combining angular and spatial information from multibeam backscatter data for improved unsupervised acoustic seabed segmentation”, Shallow Survey 2012. Wellington, New Zealand, 2012. L. A. Mayer, “The Continental Shelf and Changing Sea Level”, in Maritime Boundary Diplomacy, Center for Oceans Law and Policy Series, M. Nordquist and J. Moore, N., Eds. Martinus Nijhoff Publishers, 2012, pp. 197-212. L. A. Mayer, Roach, J. A., and Baker, B., “Deepwater Horizon and the Arctic: Is there a Need for International Regulation?”, in The Law of the Sea Convention: U.S. Accession and Globalization, Center for Oceans Law and Policy Series., Leiden, South Holland, The Netherlands: Martinus Nijhoff Publishers, 2012, pp. 512 - 528. L. L. Whitcomb, Bowen, A., Yoerger, D., German, C. R., Kinsey, J., Mayer, L. A., Jakuba, M., Gomez-Ibanez, D., Taylor, C., Machado, C., Howland, J., Kaiser, K., and Heintz, M., “Development of Nereid-UI: A Remotely Operated Underwater Vehicle for Oceanographic Access Under Ice”, 2012 Fall Meeting, American Geophysical Union (AGU). San Francisco, CA, United States, 2012. K. L. Bell, Ballard, R., Brennan, M. L., Raineault, N. A., Shank, T. M., Mayer, L. A., Roman, C., Mitchell, G., and Coleman, D. F., “Exploration of the Black, Aegean, and Mediterranean Seas Aboard E/V Nautilus”, 2012 Fall Meeting, American Geophysical Union (AGU). San Francisco, CA, United States, 2012. G. Mitchell, Mayer, L. A., and Rzhanov, Y., “Exploring Eratosthenes Seamount with Deep Submergence Vehicles, Telepresence, and the E/V Nautilus”, Oceans-12. Hampton Roads, VA, USA, 2012. M. Jakobsson, Mayer, L. A., Coakley, B., Dowdeswell, J., Forbes, S., Fridman, B., Hodnesdal, H., Noormets, R., Gardner, J. V., Armstrong, A. A., Pedersen, R., Rebesco, M., Schenke, H. W., Zarayskaya, Y., Accettella, D., Anderson, R. M., Bienhoff, P., Camerlenghi, A., Church, I., Edwards, M., Hall, J. K., Hell, B., Hestvik, O., Kristoffersen, Y., Marcussen, C., Mohammad, R., Mosher, D. C., Nghiem, S. V., Pedrosa, M. T., Travaglini, P. G., and Wetherall, P., “The International Bathymetric Chart of the Arctic Ocean (IBCAO) version 3.0”, Geophysical Research Letters, vol. 39. 2012. X. Guinda Salsamendi, Gracia, A., Puente, A., Juanes, J. A., Rzhanov, Y., and Mayer, L. A., “Landscape Mosaicing Techniques Versus Traditional Sampling Procedures for the Assessment of Subtidal Macroalgae Communities”, ECSA'12. Venice, Italy, 2012. T. C. Weber, Mayer, L. A., Beaudoin, J., Jerram, K., Malik, M. A., Shedd, B., and Rice, G. A., “Mapping Gas Seeps with the Deepwater Multibeam Echosounder on Okeanos Explorer”, Oceanography, vol. 25. 2012. J. Beaudoin, Weber, T. C., Jerram, K., Rice, G. A., Malik, M. A., and Mayer, L. A., “Multibeam Echosounder System Optimization for Water Column Mapping of Undersea Gas Seeps”, 2012 Canadian Hydrographic Conference. Niagara Falls, Ontario, Canada, 2012. A. Abramova, Monahan, D., Mayer, L. A., Lippmann, T. C., and Calder, B. R., “Quality Assessment of GEBCO 08, Smith and Sandwell and SRTM30 Plus Grids in the Arctic”, 2012 Fall Meeting, American Geophysical Union (AGU). San Francisco, CA, United States, 2012. L. A. Mayer, “Recent Advantages in Ocean Mapping”, The Journal of Ocean Technology, vol. 7, no. 2. pp. 1 - 12, 2012. D. C. Mosher, Shimeld, J., Hutchinson, D. R., Jackson, R., Chian, D., Lebedeva-Ivanova, N., Oakey, G., Evangaletos, J., Li, Q., Funct, T., Mayer, L. A., Verhoef, J., and Forbes, S., “Re-evaluating Amerasian Basin tectonics and sedimentation with new geophysical data”, International Geological Conference (IGC). Brisbane, Australia, 2012. S. H. Hickman, Hsieh, P. A., Mooney, W. D., Enomoto, C. B., Nelson, P. H., Mayer, L. A., Weber, T. C., Moran, K., Flemings, P. B., and McNutt, M. K., “Scientific basis for safely shutting in the Macondo Well after the April 20, 2010 Deepwater Horizon blowout”, Proceedings of the National Academy of Sciences. 2012. T. C. Moore, Mayer, L. A., and Lyle, M., “Sediment Mixing in the Tropical Pacific and Radiolarian Stratigraphy”, G-Cubed. 2012. L. A. Mayer, Armstrong, A. A., Hutchinson, D. R., Van Pay, B., and Moore, B., “Status of U.S. Mapping Activities in the Arctic”, International Scientific Conference on the Extended Continental Shelf in the Arctic. Portsmouth, NH, USA, 2012. L. A. Mayer, “A U.S. Practitioner's Perspective”, in Contributions on Comparative Public Law and International Law, Max Plank Institute, 2012. A. De Robertis, Weber, T. C., Mayer, L. A., and Wilson, C., “Acoustic observations of the deep scattering layer during the Deepwater Horizon oil spill”, 161st meeting of the Acoustical Society of America. Seattle, WA, USA, 2011. A. Abramova, Lippmann, T. C., Calder, B. R., Mayer, L. A., and Monahan, D., “Comparison and evaluation of publicly available grids in the Arctic”. 2011. Y. Rzhanov, Fonseca, L., and Mayer, L. A., “Construction of seafloor thematic maps from multibeam acoustic backscatter angular response data”, Computers and Geosciences Journal. Elsevier, Cambridge, MA, USA, 2011. T. C. Weber, Beaudoin, J., Shedd, B., Malik, M. A., Jerram, K., Rice, G. A., and Mayer, L. A., “Detecting and mapping gas seeps with a deepwater multibeam echosounder”, Subsea and Arctic Leak Detection Symposium. Houston, TX, USA, 2011. K. L. Bell, Ballard, R., Coleman, D. F., Roman, C., Brennan, M. L., Turanli, T., Duman, M., Carey, S., Nomikou, P., Marani, M., Rosi, M., Austin, J. A., Canals, M., Karson, J., Mayer, L. A., and Makovsky, Y., “New Frontiers in Ocean Exploration: The 2011 E/V NAUTILUS Field Season”, 2011 Fall Meeting, American Geological Union (AGU). San Francisco, CA, USA, 2011. K. Brumley, Miller, E. L., Mayer, L. A., Wooden, J. L., and Dumitru, T. A., “Petrography and U-Pb zircon geochronology of Caledonian age orthogneisses dredged from the Chukchi Borderland, Arctic Ocean”, 2011 Fall Meeting, American Geological Union (AGU). San Francisco, CA, USA, 2011. L. A. Mayer and Armstrong, A. A., “U.S. Law of the Sea Cruise to Map the Foot of the Slope and 2500-m Isobath of the U.S. Arctic Ocean Margin”, Center for Coastal and Ocean Mapping (CCOM)/Joint Hydrographic Center (JHC), 2011. L. D. Trusel, Cochrane, G. R., Etherington, L., Powell, R. D., and Mayer, L. A., “Marine Benthic Habitat Mapping of Muir Inlet, Glacier Bay National Park and Preserve, Alaska, with an Evaluation of the Coastal and Marine Ecological Classification Standard III”, U.S. Geological Survey (USGS), Scientific Investigations Map 3122, 2010. K. L. Bell, Ballard, R., Coleman, D. F., Roman, C., Brennan, M. L., Turanli, T., Carery, S., Nomikou, P., Vougioukalakis, G., Mayer, L. A., Nicolaides, S., Konnaris, K., Shank, T. M., Austin, J. A., Ben-Avraham, Z., and Phillips, B., “New Frontiers in Ocean Exploration: The 2010 E/V Nautilus Field Season”, American Geophysical Union (AGU). San Francisco, CA, USA, 2010. D. C. Mosher, Shimeld, J., Jackson, R., Hutchinson, D. R., Chapman, B., Chian, D., Childs, J. R., Mayer, L. A., Edwards, D. B., and Verhoef, J., “Sedimentation in Canada Basin, Western Arctic”, American Geophysical Union (AGU). San Francisco, CA, USA, 2010. V. E. Schmidt, Raineault, N. A., Skarke, A., Trembanis, A., and Mayer, L. A., “Correction of Bathymetric Survey Artifacts Resulting from Apparent Wave-Induced Vertical Position of an AUV”, Canadian Hydrographic Conference (CHC). Quebec City, Quebec, Canada, 2010. M. Jakobsson, Nilsson, J., O'Regan, M. A., Backman, J., Lowemark, L., Dowdewell, J., Mayer, L. A., Polyak, L., Colleoni, F., Anderson, L., Bjork, G., Darby, D., Eriksson, J., Hanslik, D., Hell, B., Marcussen, C., Sellen, E., and Wallin, A., “An Arctic Ice Shelf During MIS 6 Constrained by New Geophysical and Geological Data”, Quarternary Science Review, vol. 29. Wiley, pp. 3505-3517, 2010. D. R. Hutchinson, Mosher, D. C., Shimeld, J., Jackson, R., Chian, D., Edwards, D. B., Hart, P. E., and Mayer, L. A., “A New Look at Northwind Ridge: Implications for the History of the Canada Basin”, American Geophysical Union (AGU). San Francisco, CA, USA, 2010. L. A. Mayer, Weber, T. C., Gardner, J. V., Malik, M. A., Beaudoin, J., and Doucet, M., “More than the Bottom: Multibeam Sonars and Water-column Imaging”, American Geophysical Union (AGU). San Francisco, CA, USA, pp. 1-1, 2010. L. A. Mayer, “Seafloor Mapping and Exploration in a Changing Arctic Sea Ice Environment”, in Changes in the Arctic Environment and the Law of the Sea, vol. 33, no. M.H Nordquist, J.N. Moore & T. Heider, Leiden, South Holland, The Netherlands: Martinus Nijhoff legacy_publishers, 2010, pp. 83-106. L. Fonseca and Mayer, L. A., “Remote estimation of surficial seafloor properties through the application Angular Range Analysis to multibeam sonar data”, Marine Geophysical Researches, vol. 28. Springer Publisher, New York, NY, USA, pp. 119-126, 2007. M. A. Malik and Mayer, L. A., “Investigation of Seabed Fishing Impacts on Benthic Structure using Multi-beam Sonar, Sidescan Sonar, and Video”, ICES Journal of Marine Science, vol. 64. Elsevier, New York, NY, USA, pp. 1053-1065, 2007. J. V. Gardner, Calder, B. R., Hughes Clarke, J. E., Mayer, L. A., Elston, G. R., and Rzhanov, Y., “Drowned shelf-edge delta complexes and barrier islands and related features along the outer continental shelf north of the head of De Sotot Canyon, NE Gulf of Mexico”, Geomorphology, vol. 89. Elsevier, New York, NY, USA, pp. 370-390, 2007. B. A. Bekins, Spivack, A. J., Davis, E. E., and Mayer, L. A., “Dissolution of biogenic ooze over basement edifices in the equatorial Pacific with implications for hydrothermal ventilation of the oceanic crust”, Geology, vol. 35. The Geological Society of America (GSA), pp. 679-682, 2007. A. A. Armstrong, Gardner, J. V., and Mayer, L. A., “Multibeam Bathymetry Mapping for U.S. UNCLOS Concerns: A Gold Mine for Marine Geology”, American Geophysical Union (AGU). San Francisco, CA, USA, 2007. L. A. Mayer, Raymond, R., Glang, G., Richardson, M. D., Traykovski, P., and Trembanis, A., “High Resolution Mapping of Mines and Ripples at the Martha's Vineyard Coastal Observatory”, IEEE Journal of Oceanic Engineering, vol. 32. IEEE, Washington DC, Washington DC, USA, pp. 133-149, 2007. S. P. Gulick, Lowe, L. A., Pavlis, T. L., Gardner, J. V., and Mayer, L. A., “Geophysical Insights into the Transition Fault Debate: Propagating Strike Slip in Response to Stalling Yakutat Block Subduction in the Gulf of Alaska”, Geology, vol. 35. The Geological Society of America (GSA), pp. 763-766, 2007. M. A. Malik and Mayer, L. A., “Assessing Bottom Gear Impact in the WGOM Closure Area: A Multifaceted Approach”, Western Gulf of Maine Closure Area Symposium. Durham, NH, USA, 2007. M. Weirathmueller, Weber, T. C., Schmidt, V. E., McGillicuddy, G., Mayer, L. A., and Huff, L. C., “Acoustic positioning and tracking in Portsmouth Harbour, New Hampshire”, IEEE Oceans. Vancouver, British Columbia, Canada, pp. 0-0, 2007. A. Andronikov, Mukasa, S. B., Mayer, L. A., and Brumley, K., “First Recovery of Submarine Basalts from the Chukchi Borderland and Alpha/Mendeleev Ridge, Arctic Ocean”, American Geophysical Union (AGU), vol. 89. San Francisco, CA, USA, pp. 2123-2124, 2007. M. Jakobsson, Backman, J., Rudels, J., Nycander, J., Frank, M., Mayer, L. A., Jokat, W., Sangiorgi, F., O'Regan, M. A., Brinkhuis, H., King, J. W., and Moran, K., “The Early Miocene Onset of a Ventilated Circulation Regime in the Arctic Ocean”, Nature, vol. 447. Nature Publishing Group, pp. 986-990, 2007. J. V. Gardner, Mayer, L. A., and Armstrong, A. A., “High Resolution Mapping in support of UNCLOS Article 76: Seeing the seafloor with new eyes”, U.S. Hydrographic Conference (US HYDRO). Norfolk, VA, USA, pp. 12-13, 2007. J. V. Gardner, “High-resolution mapping in support of UNCLOS Article 76: Seeing the seafloor with new eyes”, U.S. Hydro Conference. Norfolk, VA, 2007. L. Fonseca and Mayer, L. A., “Multibeam Echo Sounding as a Tool for FIsheries Habitat Studies”, American Geophysical Union (AGU). Acapulco, Acapulco, Mexico, pp. 1-2, 2007. S. P. Gulick, Lowe, L. A., Pavlis, T. L., Mayer, L. A., and Gardner, J. V., “New Iinsights into the Transition Fault Debate: Propagating Strike-slip in Response to Stalled Subduction in the Gulf of Alaska”, Geology, vol. 35. The Geological Society of America (GSA), pp. 763-766, 2007. L. A. Mayer and Armstrong, A. A., “U.S. Law of the Sea Cruise to Map the Foot of the Slope and 2500-m Isobath of the U.S. Arctic Ocean Margin. Cruise Report for 2007”, University of New Hampshire (UNH), Center for Coastal and Ocean Mapping (CCOM)/Joint Hydrographic Center (JHC), 2007. B. J. Kraft, de Moustier, C., Calder, B. R., and Mayer, L. A., “High Resolution Mapping and Backscatter Studies in Support of the Ripples Program”, Journal of the Acoustical Society of America, vol. 120, pp. 3180-3180, 2006. B. J. Kraft, Overeem, I., Holland, C. W., Pratson, L. F., Syvitski, J. P., and Mayer, L. A., “Stratigraphic model predictions of Geoacoustic properties”, IEEE Journal of Oceanic Engineering, vol. 31. IEEE, Washington DC, Washington DC, USA, pp. 266-283, 2006. Y. Rzhanov, Mayer, L. A., Beaulieu, S. E., Soule, S. A., and Fornari, D. J., “Non-iterative Global Alignment of Image Sequences”, International Association of Science and Technology for Development (IASTED). Honolulu, HI, USA, 2006. L. G. Ward, Malik, M. A., Cutter Jr., R. G., Brouder, M. A., Grizzle, R. E., Mayer, L. A., and Huff, L. C., “High Resolution Benthic Mapping Using Multibeam Sonar, Videography, and Sediment Sampling in the Gulf of Maine: Application to Geologic and Fisheries Research.”, Annual Meeting Geological Society of America (GSA), vol. 38. Boston, MA, USA, pp. 0-377, 2006. A. A. Armstrong, Mayer, L. A., Mr. Case, J. D., and Fonseca, L., “New Multibeam Mapping of the Gulf of Maine”, GIS Conference. Cambridge, MA, USA, 2006. S. E. Beaulieu, Shank, T. M., Soule, S. A., Fornari, D. J., Rzhanov, Y., and Mayer, L. A., “Automated generation of geo-referenced mosaics from video collected by deep submergence vehicles: an example from Rosebud vent (Galapagos Rift)”, Deep-Sea Biology Symposium (DSBS). London, London, UK, pp. 1-1, 2006. R. L. Evans, Kraft, B. J., and Mayer, L. A., “Use of Seafloor Electromagnetic and Acoustic Backscatter Data for Seafloor Classification: An Example from Martha's Vineyard, Massachusetts”, American Geophysical Union (AGU). San Francisco, CA, USA, 2006. M. A. Malik and Mayer, L. A., “Detection of Bottom Fishing Impacts on Benthic Structure Using Multibeam Sonar, Side Scan Sonar, Video and Interactive 3-D GIS”, GIS Conference. Cambridge, MA, USA, 2006. R. E. Grizzle, Ward, L. G., Mayer, L. A., Cooper, A. B., Rosenberg, A. A., Brouder, M. A., Greene, J. K., Abeels, H. A., and Malik, M. A., “Effects of the Western Gulf of Maine Closure Area on Bottom Habitats: A Preliminary GIS-based Assessment”, GIS Conference. Cambridge, MA, USA, 2006. R. Ballard, Hammond, S., and Mayer, L. A., “NOAA's OKEANOS EXPLORER and Telepresence Technology”, Marine Technology Reporter, vol. 49. Maritime Activity Reports, Inc., pp. 24-33, 2006. Y. Rzhanov, Mayer, L. A., Beaulieu, S. E., Shank, T. M., Soule, S. A., and Fornari, D. J., “Deep Sea Geo-referenced Video Mosaics”, IEEE Oceans. Boston, MA, USA, 2006. P. R. Vogt, Jung, W., Jakobsson, M., Mayer, L. A., and Williamson, M., “The Alpha-Mendeleev Magmatic Province, Arctic Ocean: A New Synthesis”, American Geophysical Union (AGU). Baltimore, MD, USA, 2006. J. V. Gardner, Mayer, L. A., and Armstrong, A. A., “Mapping Supports Potential Submission to U.N. Law of the Sea”, EOS Transactions, American Geophysical Union, vol. 87. American Geophysical Union , Washington DC, Washington DC, USA, pp. 157-159, 2006. S. P. Gulick, Willems, B. A., Feymueller, J., Powell, R. D., Jaeger, J. M., Kalbas, J., Pavlis, T. L., Lowe, L. A., Mayer, L. A., and Gardner, J. V., “Significant Tectonic and Climatic Events for the Yakutat Block Collision, Gulf of Alaska: Pleistocene Glacial Intensification in the St. Elias Mountains and the Relationship Between the Fairweather and Transition Faults”, Geological Society of America: Backbone of the Americas (GSA). Mendoza, Mendoza, Argentina, pp. 1-2, 2006. M. A. Malik and Mayer, L. A., “Bottom fishing impacts on benthic structure using multibeam sonar, sidescan and video”, U.S. Hydrographic Conference (US HYDRO). San Diego, CA, USA, pp. 0-0, 2005. L. Fonseca, Mayer, L. A., and Kraft, B. J., “Seafloor Characterization Through the Application of AVO Analysis to Multibeam Sonar Data”, University of Bath Boundary Influences in High Frequency Shallow Water Acoustics. Bath, UK, UK, pp. 0-0, 2005. M. Jakobsson, Armstrong, A. A., Calder, B. R., Huff, L. C., Mayer, L. A., and Ward, L. G., “On the use of historical bathymetric data to determine changes in bathymetry”, International Hydrographic Review, vol. 6. Geomatics Information & Trading Center - GITC, Lemmers, Amsterdam, The Netherlands, pp. 25-41, 2005. L. A. Mayer, “Frontiers in Seafloor Mapping and Visualization”, Marine Geophysical Researches, vol. 27. Springer Publisher, New York, NY, USA, pp. 7-17, 2005. M. Jakobsson, Gardner, J. V., Vogt, P. R., Mayer, L. A., Armstrong, A. A., Backman, J., Brennan, R. T., Calder, B. R., Hall, J. K., and Kraft, B. J., “Multibeam Bathymetric and Sediment Profiler Evidence for Ice Grounding on the Chukchi Borderland, Arctic Ocean”, Quaternary Research, vol. 63. Elsevier, New York, NY, USA, pp. 150-160, 2005. Y. Rzhanov, Mayer, L. A., Beaulieu, S. E., Soule, S. A., Shank, T. M., and Fornari, D. J., “Automated Generation of Geo-referenced Mosaics from Video Data Collected by Deep Submergence Vehicles: Preliminary Results”, EOS Transactions, American Geophysical Union . San Francisco, CA, USA, pp. 0-0, 2005. L. A. Mayer, Raymond, R., Glang, G., Richardson, M. D., Traykovski, P., and Traykovski, P., “High-Resolution Mapping of Mines and Ripples at the Martha's Vineyard Coastal Observatory”, IEEE Journal of Oceanic Engineering, vol. 32. IEEE, Washington DC, Washington DC, USA, pp. 133-149, 2005. L. A. Mayer, de Moustier, C., Kraft, B. J., and Calder, B. R., “High-resolution Mapping and Backscatter Studies in Support of the Ripples DRI, Ripples DRI Program”, University of New Hampshire (UNH), Center for Coastal and Ocean Mapping (CCOM)/Joint Hydrographic Center (JHC), 2005. R. G. Cutter Jr., Rzhanov, Y., Mayer, L. A., and Grizzle, R. E., “Ground-truthing benthic habitat characteristics using video mosaic images: Benthic Habitats and the Effects of Fishing”, American Fisheries Society Symposium, vol. 41. American Fisheries Society, Bethesda, MD, USA, pp. 171-179, 2005. L. A. Mayer, Jakobsson, M., and Hall, J. K., “Challenges of Collecting Law of the Sea Data in the Arctic: The Arctic and Law of the Sea”, in International Energy Policy, the Arctic and the Law of the Sea, 9th ed., no. M.H. Nordquist, J.N. Moore & A.S. Skaridov, Leiden, South Holland, The Netherlands: Martinus Nijhoff legacy_publishers, 2005, pp. 125-140. B. J. Kraft, Ressler, J., Mayer, L. A., Fonseca, L., and McGillicuddy, G., “Insitu Measurement of Sediment Acoustic Properties”, International Conference for Underwater Acoustic Measurements (ICUAM). Heraklion, Crete, Greece, pp. 0-0, 2005. M. Rognstad, Anderson, R. M., Chayes, D. N., and Mayer, L. A., “Seafloor Sounding in Polar and Remote Regions (SSPARR) Project - Initial Field Trials”, EOS Transactions, American Geophysical Union . San Francisco, CA, USA, pp. 0-0, 2005. S. M. Blasco, MacLean, B., Mudie, P., Sonnichsen, G., Bennett, R., Rainey, W., Scott, D., Praeg, D., Hughes Clarke, J. E., Barglett, J., Mayer, L. A., and Monahan, D., “Northwest Passage Marine Sediments: A Record of Quaternary History and Climate Change”, Annual Arctic Workshop. St. Andrews, New Brunswick, Canada, pp. 0-0, 2005. P. Traykovski, Richardson, M. D., Mayer, L. A., and Irish, J. D., “Mine Burial Experiments at the Martha's Vineyard Coastal Observatory”, IEEE Journal of Oceanic Engineering, vol. 32. IEEE, Washington DC, Washington DC, USA, pp. 150-166, 2005. G. M. Kent, Babcock, J. A., Driscoll, N. W., Harding, A. J., Dingler, J. A., Seitz, G. G., Gardner, J. V., Mayer, L. A., Goldman, C. R., Heyvaert, A. C., Richards, B. C., Karlin, R., Morgan, C. W., Gayes, P. T., and Owen, L. A., “A 60 k.y. record of extension across the western boundary of the Basin and Range Province: Estimate of slip-rates from offset shoreline terraces and a catastrophic slide beneath Lake Tahoe”, Geology, vol. 33. The Geological Society of America (GSA), pp. 365-368, 2005. L. A. Mayer, Fonseca, L., and Kraft, B. J., “Measurement of InSitu Acoustic Properties for the ONR Geoclutter Program, Annual Report, Geoclutter Program”, University of New Hampshire (UNH), Center for Coastal and Ocean Mapping (CCOM)/Joint Hydrographic Center (JHC), 2005. K. G. Foote, Chu, D., Hammar, T. R., Dr. Baldwin, K. C., Mayer, L. A., Hufnagle Jr., L. C., and Jech, J. M., “Protocols for Calibrating Multibeam Sonar”, Journal of the Acoustical Society of America, vol. 117. Acoustical Society of America, Melville, NY, USA, pp. 2013-2027, 2005. L. Fonseca and Mayer, L. A., “Mapping Near-Surface Gas with Acoustic Remote Sensing Methods, Examples from Eel River Margin, CA and Skjalfandi Bay, Iceland”, U.S. Office of Naval Research (ONR). St. Louis, MO, USA, pp. 0-0, 2005. L. A. Mayer, Gardner, J. V., Armstrong, A. A., Calder, B. R., Malik, M. A., Angwenyi, C., Karlipata, S., Montoro, H., Morishita, T., and Mustapha, A., “New Views of the Gulf of Alaska Margin Mapped for UNCLOS Applications”, University of New Hampshire (UNH), Center for Coastal and Ocean Mapping (CCOM)/Joint Hydrographic Center (JHC), 2005. J. V. Gardner, Mayer, L. A., Armstrong, A. A., Donaldson, P., Infantino, J., Davis, G., Smith, D., Lobecker, E., Cartwright, D., Iwachiw, J., Farr, S., Meadows, D., Dorsey, S., Marsh, G., and Owen, W., “New Views of the U.S. Atlantic Margin Mapped for UNCLOS Applications”, EOS Transactions, American Geophysical Union , vol. 86. San Francisco, CA, USA, pp. 0-2, 2005.